A warning that allegedly shows a photo of a permanently disfigured woman after her marijuana or pot bong exploded. The photo was found posted on the Christians for Michele Bachmann, a satire page on Facebook. The person in the photo did not get that way from an exploding bong. It was the make up work of artist Scarlett Starlet. 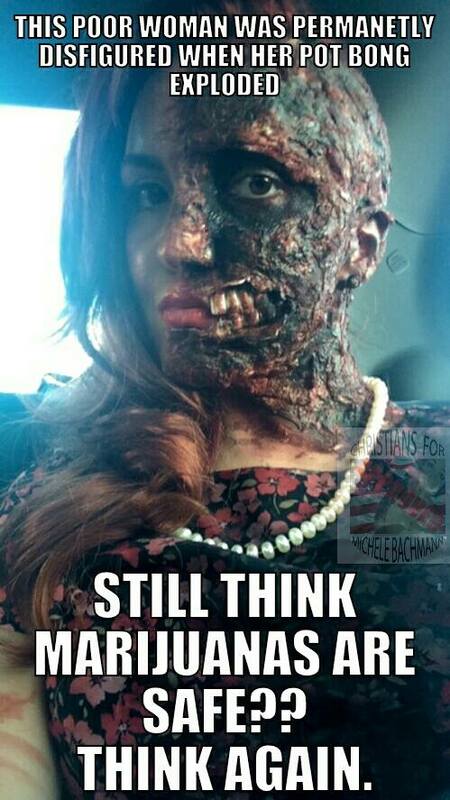 On the Imgur.com website she submitted the photo and said that she got the inspiration from Two Face, a villain on the Batman's comic series. Under normal conditions, bongs do not explode. Some marijuana users will fill them with water or wine to soften the taste of the pot that they smoke through the pipes.